Typical Gothic buildings had asymmetrical exteriors as opposed to the symmetrical form of the Classical Georgian style. Here we describe typical architectural features of neo-Gothic walls, roofs, windows, and doors. The roof was steeply pitched, typically at 60 degrees in better houses but lower in cheaper homes. The roof was covered with slates, sometimes partly in diamond and fish-scale patterns. The ridges were topped with terracotta ridge tiles or a cast iron crest, and finials. Roof features included spires and turret-style roofs. Gothic floral capitals appeared in the 1850s and were common from the late 1870s, being used for columns and pilasters supporting window lintels. While many houses with Gothic influences continued to use sash windows, more purely Gothic houses tended to use iron casement windows with small panes. Some windows had a pointed arch to the head (top). 'Feature' windows included oriels and lancets. Leaded and stained glass was used widely, in rich reds, greens and blues, with highlights in gold. 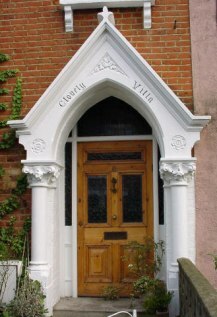 Gothic doorways were in stone, brick or wood. As with windows, floral capitals supporting the porch roof were typical.